Home / Angela Huffman's Reflections / Back on the Set of Fons & Porter! Back on the Set of Fons & Porter! Someone pinch me, I think I’ve been walking around in a dream! Last week was a whirlwind of a week. It would have been enough just having the amazing Bethanne Nemesh in the showroom teaching a series of custom quilting classes (more on that later!). But there was more, so much more! Last week I was back in Des Moines to visit the set of Fons & Porter’s Love of Quilting, the nationally syndicated quilting show on PBS. I’ve been on the show many times as a guest, usually chatting with Mary Fons about longarms and quilting techniques. I will say that just being invited to be on the show for another guest appearance would have made me ecstatic. But it was SO much more! 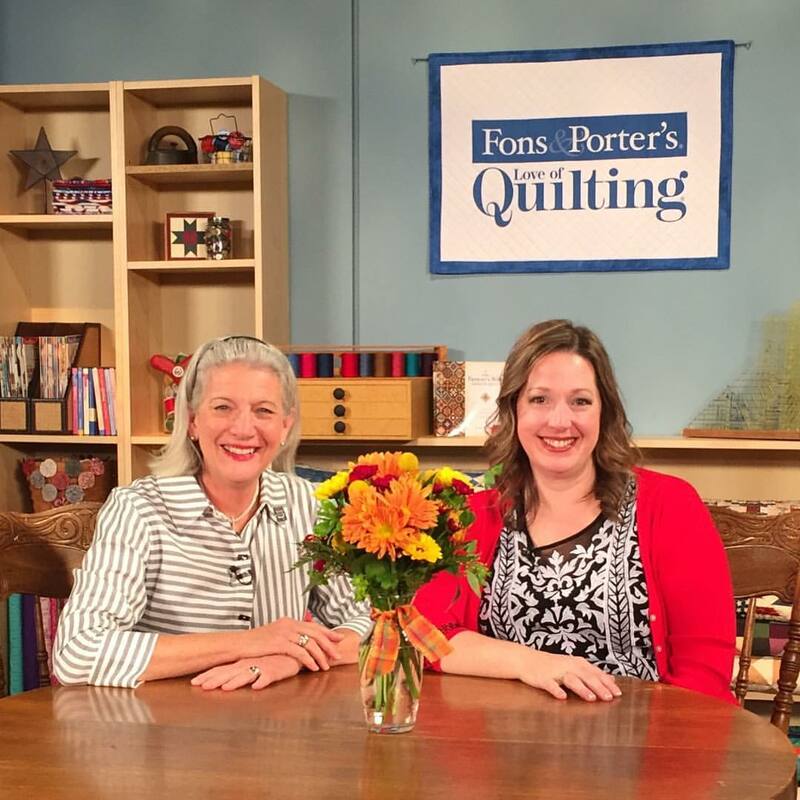 I am the new guest host of the 2900 series of Fons & Porter’s Love of Quilting!! Like I said, walking around in a dream! I’ve been so nervous for weeks. And the butterflies really started fluttering when I learned I would be hosting with the quilting queen herself, Marianne Fons! With Marianne by my side, the tapings flew by without a hitch. There’s a reason why Love of Quilting has been on for so long. After spending time with Marianne I better understand why so many people love inviting her into their homes every week. I spent day two with another quilter I admire so much, Karen McTavish. On Fons & Porter’s Facebook page you can watch a behind the scenes video of Karen and I on set, playing with the APQS Millie and talking longarm quilting. I wrapped up this unbelievable experience at the tips table with Marianne. I’ll be in every episode of the 2900 series doing the tips segment with Marianne. Oh, and don’t miss those beautiful flowers delivered to the set from my sweetie! I was floored when the crew brought the beautiful bouquet on the set. I got all weepy and the makeup artist was warning me not to let too many tears fly because she had just finished putting on my makeup! I’m having trouble finding the words to describe how tremendous this experience was. The crew and staff on set were truly wonderful, kind, and encouraging. I want to thank the Fons & Porter’s team for offering this to me, it’s been a dream come true! And I want to thank all of you who have supported me and encouraged me over the years. None of this is possible without you! My episodes of the 2900 series begin airing around the country in the spring on a PBS station near you! Be sure to check your local listings as each PBS affiliate airs the episodes at different times and days. If you’re like me and live in the Kentucky area and receive KET, I’ll be sure to let you know when the episodes begin to air right here. You can also stay up to date with my crazy life over on Facebook and Instagram. I can usually post there before I can here. For now, my fellow Kentuckians can catch my previous guest appearance on Love of Quilting with Mary Fons this Saturday Oct. 1 on KET at 11:30am. Watch the video below for a preview of the episode.